Magento is one of the best content management system to setup a ecommerce & online store. If you are looking for best magento theme then you can check out the following magento theme collection. These magento themes are suitable for variety of websites. These themes are well coded, light-weight, responsive and affordable for most of the website owners. Our magneto themes are designed to be used with clean install without sample data that is provided with the default theme. Installation: Installation and setup instructions are attached (look for Documentation folder). Short description: Grey wooden texture in the background imparts depth to the layout. Four big nice promo banners divide store products into smaller categories and make browsing easier. Search form is built into the main menu bar. New products are supplied with three icon-based buttons. Tooltips make the navigation more understandable. Three service banners are right above the footer. 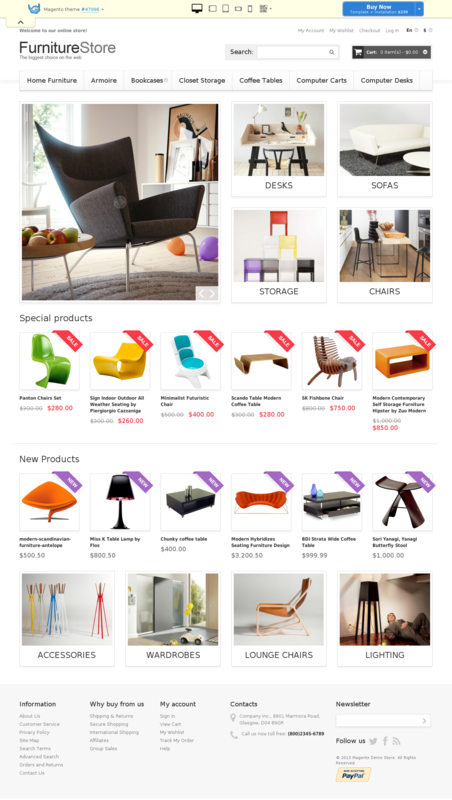 Kind of shops: The template was created for online flooring and furniture stores. Short description: If you are a real fop and follow all latest fashion trends, this website is the right one for you. Its layout is simply stuffed with various modern spices. Flat elements, saturated colors, long shadows, turned-in angles – all these features are ready to amaze your customers. Moreover, all colored banners interact with the user, which makes their shopping experience really unforgettable. 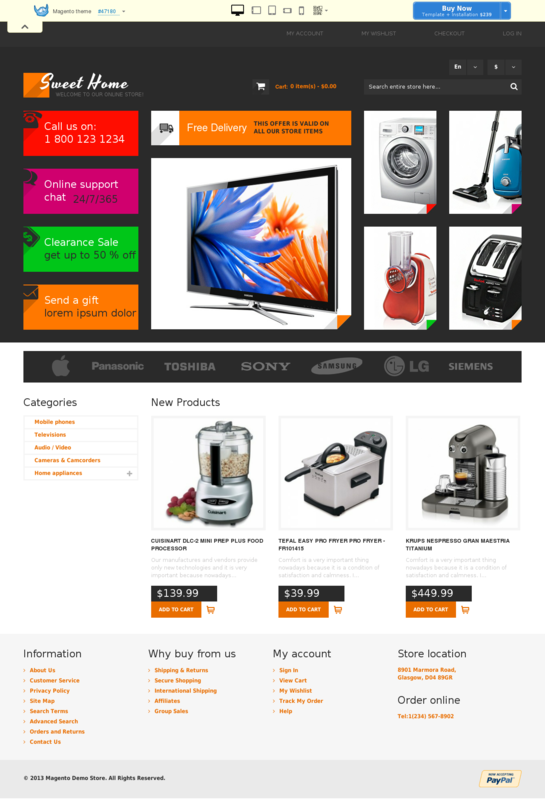 Kind of shops: The template is great for online electronics, mobile phone and digital hardware stores. Short description: The website has really futuristic design. The layout is fair and minimalistic. On hovering banners and new products, black blocks appear. Slider is divided into text and visual parts. Banners have clean outlined design. Content area offers modern computers in four columns. Newsletter subscription form can be found in the footer together with multiple service links. 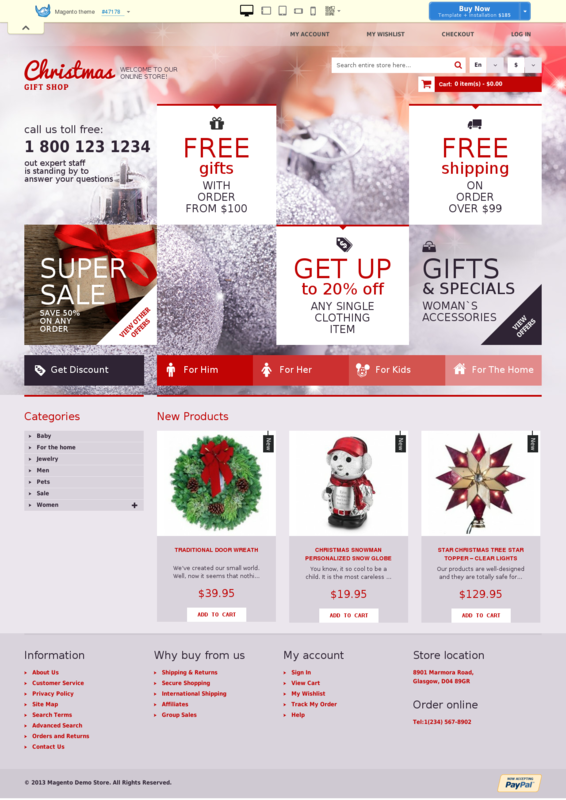 Kind of shops: The template was created specifically for online computer stores. Short description: This store pays much attention to promotional side of the website. Banners of different sizes promote special store discounts and products. Navigation by brand is available for customer’s convenience. New products come in four columns together with descriptions and orange Add to cart buttons. Auxiliary menu can be found in the footer as well as contact, social sharing and payment method blocks. Kind of shops: The template was developed specifically for online music stores. Short description: Modern, cheerful furniture items look very bright over the white background. Slider is smaller than usually and shares the space with four promo banners. Special and New products are marked with the relevant tags of red and violet colors. Four more banners are placed above the footer area. Newsletter subscription form is in the right bottom corner of the page together with social options and payment method information. Kind of shops: The template can be used for online furniture, flooring and curtain stores. Short description: Flowers are inevitable either at happy or sad occasions. We are sure that this delicate design will touch your visitors’ heart. Floral pattern in the background upholds general idea. Slider and banner images are simply superb. Banners have zooming effect. Specials block are in the right sidebar. It is illustrated with thumbnails. This tender, pink template seems to smell like a flower. 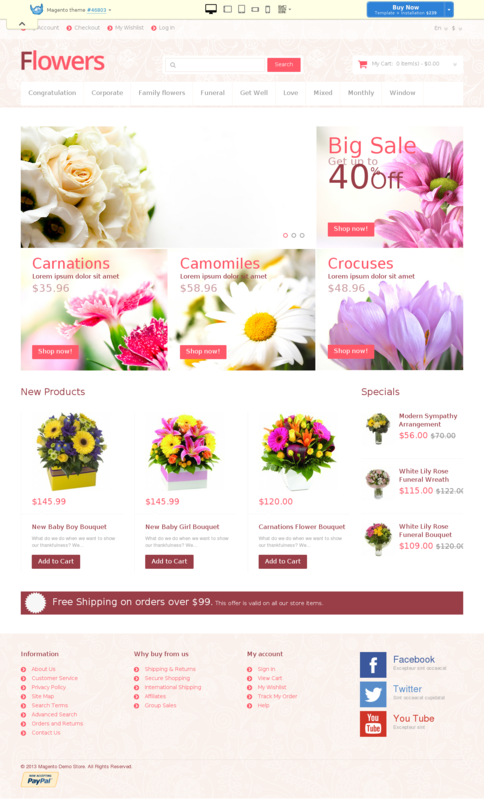 Kind of shops: The theme is best for online flower stores. Short description: The bluish color scheme of the template is very tender like everything that touches delicate infant’s skin. Banners with cute kid and tiny clothing images have rather unusual design. Round, black price stickers appear on hovering new products. Footer contains a bunch of useful information: subsidiary menu, newsletter subscription form and social media icons. Kind of shops: This design is perfect for online retailers offering kids’ clothes, toys and accessories. Short description: Slider images in this template are blurred to make text stand out better against them. Stylish banners are placed both under the slider and above the footer which makes promotion and navigation more visual and efficient. Call-to-action buttons appear on hovering items in the content area. Newsletter subscription form is in the footer area as well as contact info, social media options and additional menu. Kind of shops: This design was crafted for online fashion stores. Short description: This dark stylish template is targeted on men’s auditory. Each element takes its place, design is very balanced and harmonious. Buttons and footer lists are decorated with arrows. Slider in black and white is surrounded by colored banners having zooming effect which makes the page more original. Specials block is supplied with small images. Search by brand is available in the right sidebar. 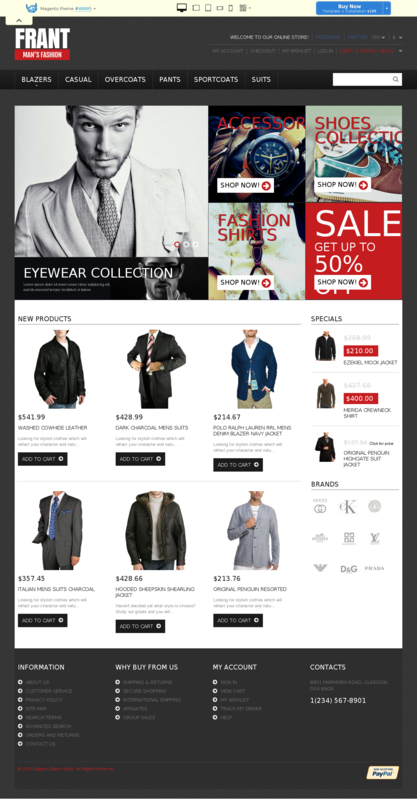 Kind of shops: The template is best for online men’s fashion stores. Short description: Cool creative slider of this template not only shows luxury speed cars, but displays their characteristics. Banners on the left hand of it provide information on how to buy and sell cars as well as get store newsletter. New products are supplied with descriptions and four functional buttons. Footer menu supplements main drop down navigation. Search form is on top of the page where it can be easily found by the users. 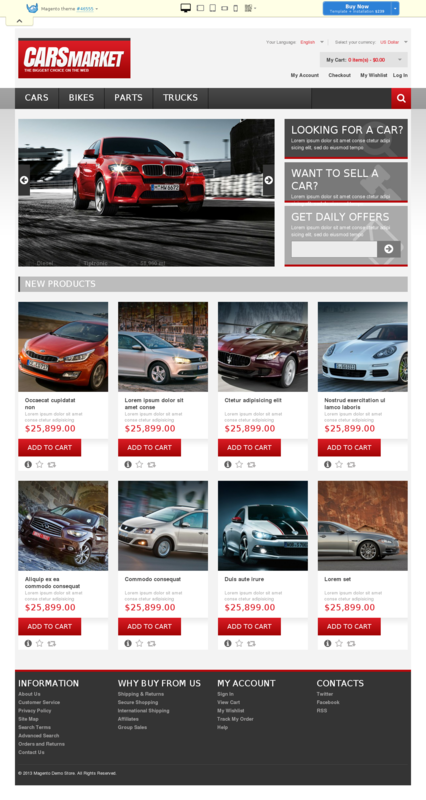 Kind of shops: Use this template for online stores selling cars, bikes and their spares. These are top themes and templates for magento, hope you like it. I will continue to update this list to add more magento themes. Please leave your suggestions and inputs to guide this list. These themes are easy to install and well coded therefore they don’t impact your page speed and provide a good user experience to your visitors.